In the UK we have an excellent National Health Service, which is the envy of many countries. Despite this, things unfortunately sometimes go wrong. Mistakes made by our medical professionals, whether in the NHS or private sector, can have devastating consequences, not only for the patient but also for their loved ones. Pursuing a clinical negligence claim can often be a complex process which is why it is so important to find a solicitor that specialises in this area. 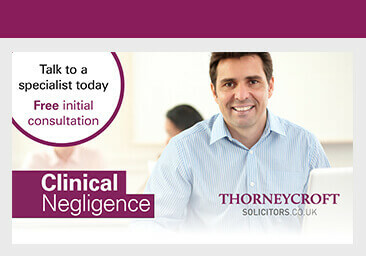 Too many firms add clinical negligence into their general portfolio of personal injury practitioners without having clinical negligence solicitors. At Thorneycroft Solicitors we have a dedicated team who specialise in this field alone. We work with the most experienced medical experts, ensuring their involvement from the outset of the claim to offer advice and guidance. There to advise you through each step of the process, from the initial advice, to possible treatment if required, we pride ourselves on our professional but caring approach. You can learn more about our caring and professional approach in the video below.